A very very rough prototype of a new instrument which may resemble an edge-trimmer has been made. So far this consists of an ergonomic handle (not a chair-leg!) connected to a magneto-rheological-fluid brake controlled by an Arduino board. Basically, the brake is switched on and off rapidly causing the handle to vibrate when pushed back and forth. 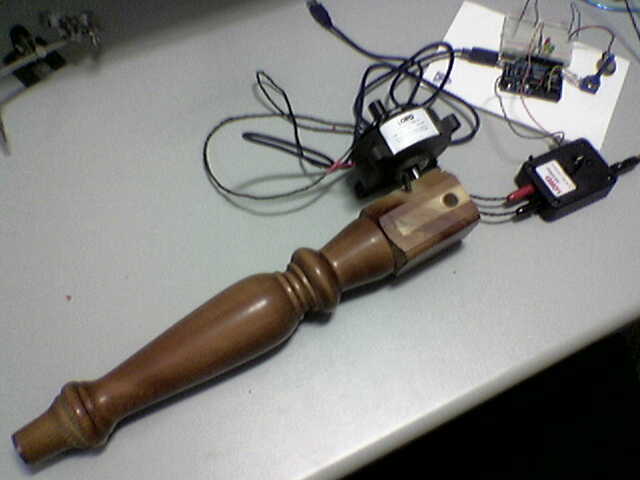 A potentiometer connected to the Arduino allows the user to simultaneously change the frequency of the pulses, and hence the pitch of the note produced. The next step is to attach two real handles, so the user can use both hands.